ASQ announced recently the silver-level award winners — along with two bronze-level teams — at its World Conference on Quality and Improvement in Milwaukee, Wis., USA. In its 31st year, 36 teams from nine countries competed for gold, silver and bronze level status. 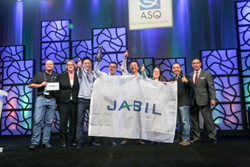 Two Teams from Jabil Circuits were awarded silver-level status, the highest level awarded this year, in ASQ's International Team Excellence Awards process. 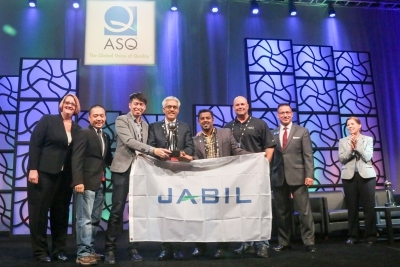 Two teams from Jabil Circuit — one from Shanghai, the other from Singapore — were awarded silver-level status as part of the ASQ International Team Excellence Awards for increasing efficiencies and financial savings. ASQ announced the silver-level award winners — along with two bronze-level teams — at its World Conference on Quality and Improvement in Milwaukee, Wis., USA. In its 31st year, 36 teams from nine countries competed for gold, silver and bronze level status. Gold, silver and bronze awards are awarded to teams that achieve scores in specific ranges in each awards level. Teams are evaluated in part in Live Case Study Sessions at WCQI, at which teams demonstrate real-life applications of quality and its benefits to organizations and their customers. No teams in this year’s awards process earned gold-level status. The Jabil Circuit, Shanghai, team used a variety of Six Sigma tools to shorten order response time to increase customer satisfaction and efficiencies. The successful project also resulted in significant annual cost savings, according the team. The Jabil Circuit, Singapore, team optimized lean and Six Sigma tools to decrease material handling costs. As a result, the team reduced warehouse process cycle time by 61 percent, reduced operating cost by 22 percent, and improved warehouse space by 92 percent. Molinos Rio de la Plata, “Loading Like Tetris” team, Buenos Aires, Argentina. Telefonica-Argentina, “Complaint Busters” team, Buenos Aires, Argentina. Since 1985, more than 1,200 teams worldwide have participated in this team recognition process. Organizations such as Alcoa, Anheuser-Busch, Bayer, Coca-Cola, Ford Motor Company, General Motors, Johnson Controls, and Ritz-Carlton Hotel Company have showcased proven results with long-term implications, resulting in cost savings of billions of dollars. Next year’s International Team Excellence Award Process final round will be held at ASQ’s 2017 World Conference on Quality and Improvement May 1–3, 2017, in Charlotte, N.C. Intent to submit forms for the 2016–17 award cycle are due July 1. For information on how to participate in the 2016–2017 International Team Excellence Award Process, visit asq.org/wcqi or email gbalagopal(at)asq(dot)org.